Hello friends. Beth Norman here. I hope my fellow Canadians had a wonderful Thanksgiving. I had a fun weekend which started out with attending an authentic Octoberfest night on Saturday night then went to a friends house for Thanksgiving with her large family. I had to work on Thanksgiving Monday, but that was okay because I just finished a week's vacation and was rested and ready to get back into routine. Adult colouring books are all the rage, but who needs them when you can colour up beautiful Technique Junkies stamps like this one? 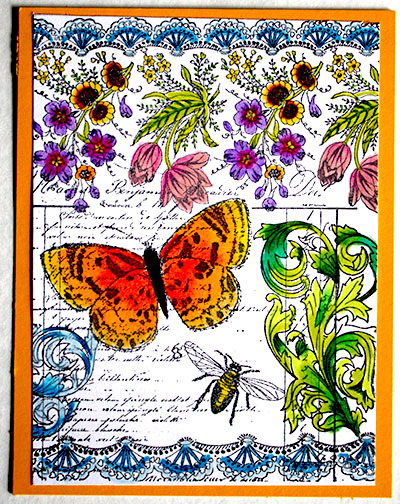 I used Vintage Botanicals Collage from the Palettini Collection. I coloured this image with my Prismacolor pencil crayons and OMS while sitting in front of the TV watching my taped TV shows. Let's see some of your colouring skills.